Rotterdam is affectionately known as the ‘City of Architecture’ because of its urban regeneration after the bombings of WW2. Its considerably large community of Expats and International Students means it’s a hub of Culture and there’s always something to do. Boijmans houses a large variety of collections, from medieval masterpieces to more modern works. Pieces from artists such as Bosch, Bruegel, Van Gogh, Monet and Magritte are all on display. 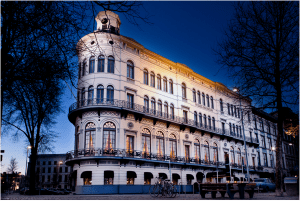 The museum is located in the center of Rotterdam, close to Witte de Withstraat, and is easily accessible by tram/metro/bike. 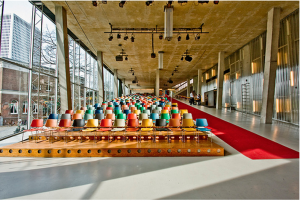 The Kunsthal Rotterdam stages around 25 exhibitions a year. Designed by a Dutch architect, Rem Koolhaas, the 3300 square meters of exhibition space is a must-see. It portrays many different aspects of culture; from old classics to new photography, lingerie expositions and works by Leonardo Da Vinci. 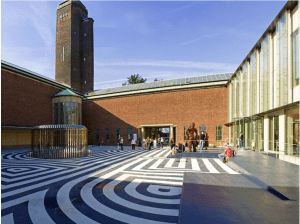 The “Wereldmuseum” is another icon of Rotterdam, where you can view an impressive collection of art that has been collected from all over the world. This museum is located close to the Erasmus Bridge. In addition to the larger museums mentioned there are countless more worth a visit. 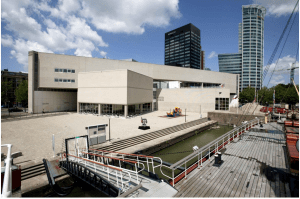 After all, Rotterdam is a very cultural city, they include but are not limited to the Natural History Museum, Dutch institute of Architecture, Nederlands’ Foto Museum and Scheepswerf De Delft. 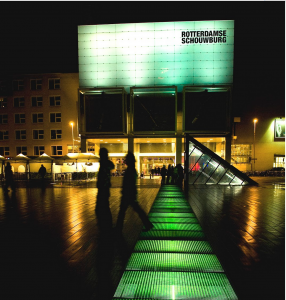 Each March the museums in Rotterdam open up their doors for a night, allowing for a Night at the Museum type adventure. You can buy tickets at the Blaak Library, around €14 pre-sale and last minute tickets are around €17.50, so make sure to get them early! A total of 50 art expositions are open and a blinking LED light will be your ticket. You can buy tickets online at http://museumnacht010.nl/ a couple of weeks before the event. The Dutch love to celebrate life. It doesn’t matter if it’s spring time when the sun comes out, or when the winter hits hard, some type of celebration is on its way to brighten up your day. Up until recently, the Netherlands had a Queen, and Queen’s day was the notoriously wonderful drunken celebration of Dutch national happiness and pride. 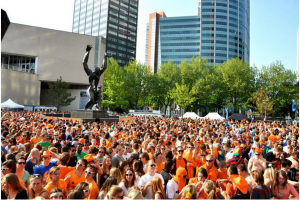 However King’s day does not disappoint. It is a celebration of the King’s birthday, and it starts the night before on the 26 of April. Throughout every city you will find boats, parades, street parties, fireworks, markets and a disproportionate use of the color orange. Get with the program and enjoy this national holiday! The evening of the 26 is dedicated to parties, the morning of the 27 is dedicated to flea markets all over the city (you can also sell your things wherever you want on this day), and from around 12:00 its beer time until the late evening. Many people go to Amsterdam for the ultimate King’s day and live it up out there which is something you need to experience at least once in your student life! The 4th of May is the remembrance day of the victims and casualties of the second world war. That day may seem more quiet, although there are only small events throughout the country. The next day is the liberation day, which is a big celebration of liberation from the German occupation. 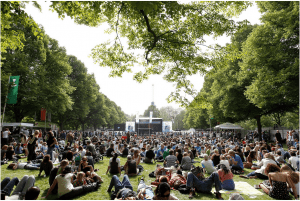 On this day you can enjoy an open air concert in Amsterdam. In the Netherlands, Santa comes early. And his name is not even Santa! This tradition is believed to be the origin of the known Santa, and it depicts an old man (Sinterklaas) that comes from Spain on a boat with a bunch of helpers, delivering gifts in the shoes of the good children. Bad children, horrifically, are taken to Spain in a bag as the story goes. Not creepy at all. In return for his graces, children leave carrots for Sinterklaas and his white horse. Yes, we know, it all sounds a bit crazy, but it’s a lot of fun! People celebrate small fun traditions, like gift exchanges, parades, costumes and many carrots in shoes all over town. It kicks off the wonderful Christmas / New year season and brings with it yummy food and jollyness. There is, however, a controversy about Sinterklaas that might seem very odd to international students. His helpers look like caricatures / stereotypical African people, or in other words, it looks like he is coming to town with his slaves. Dutch people do not see this that way, and do not think of this tradition as offensive, and the usual claim is that the helpers are dirty from going down the chimney. For us internationals, however, it is always weird to see if for the first time, and many eyebrows are justifiably raised. Its time to up your fried food game, ‘tiss the season to be very satisfied see what the streets can offer you! Great oliebollen, wonderful Christmas decorations and a fun time for everyone. Not to mention the mad Christmas and New Year’s shopping discounts coming your way. In The Netherlands, Christmas is less of a religious celebration and more of a traditional, family oriented time of the year. New Year’s eve is just like everywhere in the world, loud, wonderful and happy. The Dutch call it “Old and New” – replacing the old year with the new one that’s coming. And if there is something that unites us all, is good food and good old fashioned coziness in cold snowy days at the Erasmus bridge . Visiting the Movies (Pathe Schouwburg or Pathe Kuip) can be a great evening out for you and several friend, as English language films are subtitled in Dutch you’ll easily be able to understand them. A Pathe pass is available if you’re a serious movie buff; for 20 euros a month you can see unlimited films with exceptions at peak times. Otherwise you can get a €2 discount on cinema tickets except for on a Friday and Saturday after 18:00 so for a student its around €8.50 depending on whether its a 3D film. Perfect for a cosy date or somewhere to escape the cold. 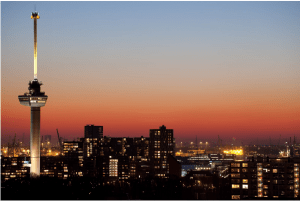 Euromast is an observation tower and you can gain free entry with the Rotterdampas. This is a listed monument and gives you great view of the city on a clear day or an even better view at night when you can see the sparkling lights of the city. Tickets cost €9.50, if you don’t have the Rotterdampas and you can easily get there by taking tram 8 from the centre and get off at the stop ‘Euromast’. 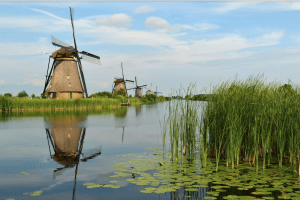 When you think of Holland, you probably think of clogs and Windmills, this preserved site gives you the chance to see Dutch History. Its located just outside of Rotterdam, built around 1740 and is one of the most popular heritage sites in the country. You can plan your journey here using the 9292 app, as it requires more than one mode of transport. You can order food for delivery on websites such as JUSTEAT.nl and THUISBEZORGD.nl with a wide range of delivery payments from cash to paypal. This could be the best way to enjoy that Sunday night before you return to studying in the morning. Prices can range from €10-15 for a single person. There are numerus restaurants within Rotterdam such. It is impossible for us to list all the places that you can visit, but if you give it a quick google its easy to find a couple of places that will suit you. Students don’t generally have to tip, though it’s nice if you do. You can choose to spend anything from €5 euros to €30 on a meal depending on what you order. Let’s jump right into it, shall we? 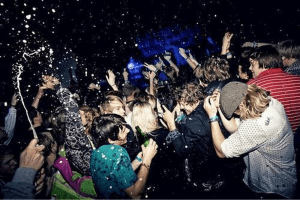 One of the things students look forward to when they study abroad is the party scene. You’ve come to the right city if you need a little kick-start to your nightlife career. Keeping the balance between work and pleasure is a delicate affair, so if you do decide to go out, definitely try to make the best of it. For all we know, you’ll be waking up to a slap in the face from all the deadlines and pressures of being a student, which is why we recommend you to join us at our monthly social drinks! You can network, make new friends, and drink at the same time! 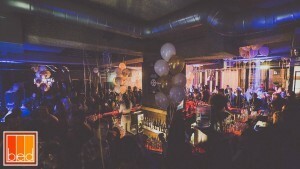 Before we tell you about the best bars and clubs, you need to know how to conduct yourself. For one, teenagers are allowed to start drinking from the age of 18. If you are under 18, you shouldn’t be in possession of alcohol nor planning to go to a bar/club if you are a law-abiding citizen. At 18, you are allowed to purchase both regular alcohol and hard liquor. You’ll find that drinking at home is much cheaper than drinking at a club, which is why pre-drinks are commonplace here. Because pre-drinks are a must, most parties start to fill up and get hyped around midnight. Keep this in mind to avoid a disappointing and boring few hours before the party really begins. Please do refrain from drinking alcohol while on the street, biking, or taking public transportation: it is against the law. Tip: You can buy alcohol under 15% alcohol content at your nearest supermarket; for stronger liquors, Gall & Gall and Dirk van den Broek are your go-to options. Drinking can be fun if it’s done in moderation (alright, having one too many is fun, too), but there’s one rule of thumb: it’s okay as long as you don’t bother anybody and keep the public peace. Being drunk at a bar/club is alright, but if you get to the point where you knock into everybody around you, either sit down, go home, or be escorted out by the bouncer. Need to puke? 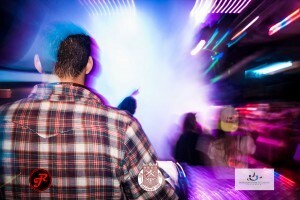 Take it outside or use the bathroom, but DO NOT puke inside club’s public space. Bouncers will not hesitate to throw you outside, remember that. This may seem like common sense, but a surprising number of people don’t act accordingly. The government outlaws smoking inside clubs and bars, but some establishments (especially clubs) ignore this and allow their patrons to smoke inside. However, if someone asks you to put it out, please abide. If you’re not sure, take a look around or you can ask a bartender if you’re allowed to. Usually bars/clubs supply smoking rooms where you can light up in a confined space. Outside the club is where things get delicate. Being drunk in public is officially a punishable offense, but walking or biking home from a party in the morning is a-okay as long as, again, you don’t bother anybody. Screaming matches and fights are often visited by the police and result in citations, fines, and sometimes even a night in jail (although a night in jail is very, very rare and only happens for repeat offenders). Do not fret! It really isn’t all that strict. Just be a sensible citizen and the police will stay off your case. 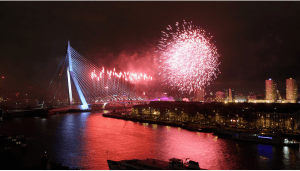 Although Rotterdam is a relatively safe city, it is always smart to take caution after returning home from a night out. Be smart: have a friend with whom you can walk or bike home and make sure people know where you are.